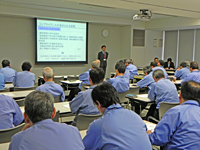 ﻿ Compliance｜Pacific Industrial Co., Ltd. The Pacific Industrial Group attaches the utmost importance to compliance in the context of its corporate management, and seeks to be a group of enterprises that conducts corporate activities in a manner that is not only fair and sincere but also highly transparent. At the same time, Pacific Industrial aims to be a Group that is capable of making a contribution to the continuous development of society. In 2008, in the context of a complete re-appraisal of the Group's internal control systems, Pacific Industrial undertook a comprehensive review of its approach towards compliance, and, in the course of so doing, prepared revised versions of its 'Pacific Industrial Group Compliance Policy', of its own 'Compliance Regulations' and of the 'Pacific Industrial Group Code of Conduct'. Strict observance of compliance constitutes the very foundations of our corporate management. Everybody involved in the management of the Group is unified in an objective of achieving further progress on the road towards a 'Glocal' enterprise that is capable of earning the trust of society, both in global terms and within each individual local community. All persons concerned are also resolved to establish even stricter standards of compliance in the future, and to raise the standards of our corporate activities commensurately. Ethics Policies of Pacific Industrial Co., Ltd. The Pacific Industrial Group shall ensure the following basics to increase the social trust and realize the business continuation. We will make efforts to fully understand the correct interpretations and procedures of domestic/international laws and regulations, and faithfully comply with them. Each employee has a common goal. Maintain professionalism, take pride in what we do, and keep a strong sense of responsibility so that we are able to make social contributions. We will comply with the various internal regulations including the Employment Regulations, code of conducts and operation standards and will act upon sufficient consultation with the supervisors, managers and persons in charge without making self-serving judgments in case of doubts. We will make efforts to prevent the occurrence of illicitness or scandals caused by the management departed from corporate philosophy and the businesses and operations against the laws and regulations, social rules and internal regulations. In addition, we will find signs for such occurrences at an early stage and make efforts for improvements. To this end, we will share information by reporting, notifying and consulting and actively communicate to solve issues in a unified structure of knowledge and power, overcoming the barriers of positions or divisions. The social trust for the Pacific Industrial Group is supported by the 'sound judgment' and 'professional view and responsibility' of each person. Every one of us will make efforts to build upon our knowledge and experiences not only on the past business experiences and knowledge but also on the laws and regulations, rules, social trends and the latest technical trends and broaden our views. The leader group shall implement the compliance with the philosophy, laws and regulations and rules by themselves (behavior consistent with one's words) and make efforts to be the models for the subordinates. In addition, they shall make the subordinates have dreams and prides as well as have their own dreams, making efforts to create the workplace full of future expectations. The development and the business continuation of the Pacific Industrial Group have been supported by the customers, business partners and regional societies. Leaning with the customers, business partners and regional societies and establishing relationships to share profits on an equal and fair basis shall be indispensable for us to continue to develop for a long time in the future, and we will make the best efforts to this end. We will provide training to all of the employees and monitor it for the compliance with the compliance policies and standards and promote necessary improvements by conforming to internal control measures and the risk management system. In addition, we will regularly review and revise the related policies and standards. Pacific Industrial does not stay at legal compliance; rather we e mbrace the expectations from the viewpoint of all our stakeholders. Our company holds high ethical standards, based on the “Pacific Industrial Group Code of Conduct,” known and observed by all of our employees. Pacific Industrial set up the “Compliance Committee” to oversee all compliance activities at our company. Promotion activities to establish and permeate compliance, and quickly stop misconduct, are continuously being improved upon. Furthermore, each department appoints a “compliance manager” to strengthen internal education and risk management. The compliance manager uses a “compliance check sheet” to understand, improve, and correct each department's compliance framework/level once a year. The results and issues from this check are reflected in the department manager's annual policy report, and promote the PDCA (Plan-Do-Check-Act cycle) of compliance to all employees at all departments with the aim of improving it further. At Pacific Industrial, March is designated as a compliance month, to deepen employees understanding and awareness of compliance. Specialized compliance seminars and classes are held at each level, and each staff member takes regular tests through the e-learning program. Improvement of compliance awareness has been made part of the corporate culture, so that such education, audits and enlightenment activities can be part of the corporate code of conduct. The Desk maintains confidentiality about the contents of reports and enquiries, and protects whistle-blowers, thereby ensuring that any persons responsible for such reports and enquiries will not be put at a disadvantage because of such actions. The contents of reports, indictments, complaints, requests and opinions are in principle accepted by Desk with the names of those responsible duly identified and recorded.